Gold looks very pretty, and today has a very high value. But will it be of any value at all WTSHTF? Most preppers already have some sort of acceptance that US currency may become less universally accepted subsequent to a Level 2 or 3 event occurring. We’ve discussed some aspects of the problems with US currency in a post WTSHTF world before. Interestingly, one of the reasons that US currency won’t be widely used is simply because most people don’t have much real cash these days. Sure, we might have large deposits in our banks, we might own stocks, shares, bonds, etc, and we might be able to borrow still more money from our credit cards or home equity, but most financial transactions we do these days are electronic, using debit or credit cards (or sometimes still checks) and we don’t need to actually pass over ‘real’ money for all these transactions. And, if we did need some real money, we can conveniently get it, 24/7, from an ATM. So most of us have only a few hundred dollars in actual cash under the bed (or wherever else you keep it). With electronic banking unavoidably becoming unavailable in a Level 2/3 scenario, we’d all find ourselves limited only to the cash we had with us at the time the event occurred. Some of us might be fortunate, and find ourselves with lots of cash, but with little in the form of essential supplies to live off. We’d be cash rich, but asset poor – the cash we own would in no way reflect the new value of the things we owned or could trade. Others of us might have little or no cash, but several years supply of essential food and other supplies. Who then is the wealthier person – the person with cash and nothing else, or the person with a basement full of essential supplies and no cash? So not only is there a lack of cash for commercial dealings, but also the cash that is available in a community doesn’t reflect the true wealth of the community in a Level 2/3 situation, and there would also be no clear conversion between cash and how much essential supplies would cost. Even if an equivalent set of values was established, what happens if another person joins the community, carrying with him a suitcase full of $100 bills, but without any food or other essential items? He would have enough money to buy all the food in the community, but who would want to swap their food they need to live on for pieces of paper with green printing on them? This act would be a bit like, at present, a foreign country printing up counterfeit US currency and spending it. So communities would necessarily have to in some way distinguish their community’s supply of cash from that of other communities, so that a person from another community couldn’t come in and destroy the financial base of their community. Although most preppers agree that US currency will become close to useless, these same people often advocate gold as a way to store value, and as a likely future currency. We disagree – read on for why we think gold will be of no more use than US cash. If you want to get a real headache, read (at least) two textbooks on economics – one advocating the benefits of the gold standard and one arguing against it. Maybe also try to find an open-minded textbook that fairly sets out the pluses and minuses of both perspectives. If you choose to do this, you’ll hopefully form the opinion that there were and are some good features of the gold standard, but also some major limitations and problems with it. Did the (do the) good features outweigh the bad, or vice versa? That’s where the controversy comes in – most economists can agree on the essential mix of good and bad points, they just can’t decide which outweighs the other. We understand and sympathize with why many people who dislike the government’s growth, largely funded by printing its own money and running deficits, and allowing inflation to eat away – to invisibly tax – the net worth of the citizens, why these people would wish a return to the gold standard, because this would limit the ability of a government to continue this type of financial growth and economic control. But we don’t believe the underlying ‘magic’ of gold still applies as being the fundamental building block of any economy; indeed, gold has never been universally accepted as the basis on which economies can be created and compared – it has always shared that role with silver. Much of this is irrelevant theory, however, for a Level 2/3 scenario in the future. 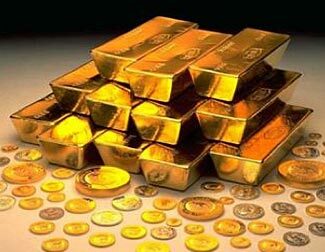 Some preppers say you should keep a supply of gold coins and/or some other form of gold, because it will be universally accepted as a new pseudo-currency after life as we know it (LAWKI) ends. We disagree, for exactly the same reasons we don’t think current US currency will survive and continue to be universally accepted. Gold and silver and all other abstract expressions of wealth all suffer from the same problems as paper money – you can’t eat them; you can’t live off them. At present, it is true that the amount of gold/silver/whatever a person has closely correlates to what they could buy with it, because there are no shortages of anything. But after LAWKI ends, and there become shortages of everything essential to life, the ability of gold and other precious metals to be converted into things of true value – life’s essentials – completely disappears, because there is no underlying value or use to the gold itself, except as a pretty metal for ornaments and jewelry. As we’ve asked before, who is the wealthier person after LAWKI ends? The man with 100 pounds of dried food, or the man with 100 pounds of gold (in today’s terms, the food might be worth $1000, and the gold would be worth almost $2.5 million). The correct answer has to be that the man with the food is wealthier (assuming food to be in short supply, which is a very safe assumption to make). If you were starving, and you met both men on the road, and one offered you a pound of food and the other a pound of gold, which would you take? Which would you agree to work for a day in return for receiving the item? The food, right? Also, exactly as the case with money, if civilization ends tomorrow, there won’t be enough gold available to provide an effective means of doing business (unless we were to make each gold coin worth a ridiculously huge amount of money). And what would happen when a stranger rides in to town with a bag full of gold coins, enough to buy all the spare food in town? Or what say one of the local residents suddenly strikes it rich, and finds some gold in the stream at the bottom of his property. Suddenly there is more total gold in the community, but it isn’t represented by a matching growth in items of value to be purchased by the gold. The only people who would take gold in exchange for items of true value would be people who were taking a gamble and betting that in some point in the foreseeable future, life would return back to close to normal, and gold would become an innately valuable metal again, just as it is now. They’d be willing to take your gold from you, while giving you very little in return, and would trade off the low value/cost of the gold now with the hope that at some future time, life will return to normal and they can cash in their gold at ‘normal’ rates. The true currency of value will be an expression of life’s essentials – maybe a ration of food or water or energy, or some sort of composite value expressing elements of all three, and exchangeable for these essentials on a known basis. So, in preparing for an adverse situation, you’ll find yourself much better off if you invest not in what today’s society accepts as abstract expressions of wealth (whether it be cash, electronic deposits, or precious metals) but rather in items that will have direct tangible value in the future. The most essential three items for survival will be food, water, and shelter, but with water being a relatively low value item, and with shelter being a very subjective item, we think the key products for measuring and storing value will be food and energy. In other words, store food and store energy. You could also store ‘meta-expressions’ of food and energy – in other words, objects that can assist in growing food and creating/capturing/storing energy. A gallon of gas or a pound of wheat would both be very valuable, but so too would a solar cell array or a wheat mill or some farming implements. This will become the future replacement of the gold standard – an energy based standard. This is a much more sustainable monetary base, because unlike gold, energy is a thing of real value.